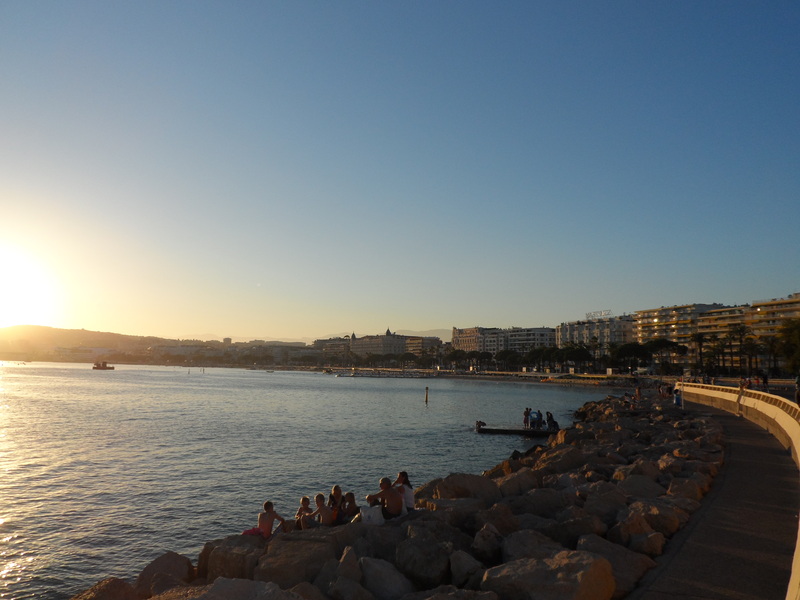 Basking in sunshine, Cannes attracts the wealthy and the vain in their thousands each year. Through the air wafts a heady mix of Chanel and arrogance that almost masks the aroma of fresh bread from boulangeries that line the busy roads. Between the Hermes-clad stick figures and noisy Ferrari’s, a small family make their way to see a proud grandfather and share some bread and grilled sardines on his balcony. It’s the simple things that bring the most joy. My father-in-law grew up in Cannes and still lives there, swimming each day and grabbing bargains from the fish monger. Cannes isn’t the friendliest place I’ve visited, in fact, the summer heat is matched only by the frosty reception from the bourgeois beach crowd and the crinkly old coffin-dodgers. However, there’s some good food to be had! My father-in-law likes to swim in the morning and then return home for a big lunch just as the midday heat is peaking. Freshly grilled sardines, saucisson, salad, merguez sausages, paella, steak hache, olives, roasted peppers, cheese and of course, baguette. Just round the corner was a beautiful little boulangerie and patisserie that makes the most delightful baguette. Crispy, light and fluffy inside. Parfait! I became very fond of their bread and brought some home with me. Traditional French bread recipes do not use preservatives, so baguette should be eaten on the day it is baked. I had some left over and couldn’t bear to throw it away. The following recipe is a great way to use up any stale bread and I’m sure that bread lovers will agree with my decision to find a use for the spare baguette. This recipe is for one serving, but a quick glance at the ingredient list and you’ll see how easy it is to make this for more people. I made bread crumbs by blitzing the baguette in a food processor. I then heated a little olive oil in a small pan and fried the crumbs with the oregano until they were a deep brown colour, but not burned. I put these to one side. Meanwhile, I began cooking the spaghetti in boiling salted water. Some people recommend adding a drop of olive oil to the water, but this is completely unnecessary as long as you give the pasta a stir to stop it from sticking. Next, I heated the garlic and onion in olive oil until cooked and then added the anchovies. I broke the anchovies up into the onion and cooked them for a further minute or so. I stirred in the parsley and the mixture was finished. 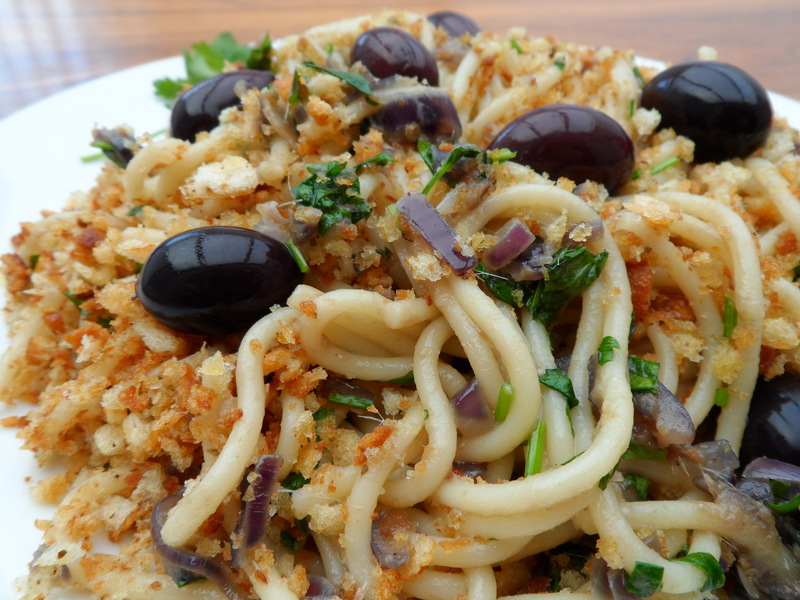 The anchovies are salty, so I didn’t need to season the mixture. I drained the spaghetti, added it to the anchovy and onion mixture and tossed it to make sure that the spaghetti strands were coated. Finally, I added the bread crumbs and ground a little black pepper over the pasta. 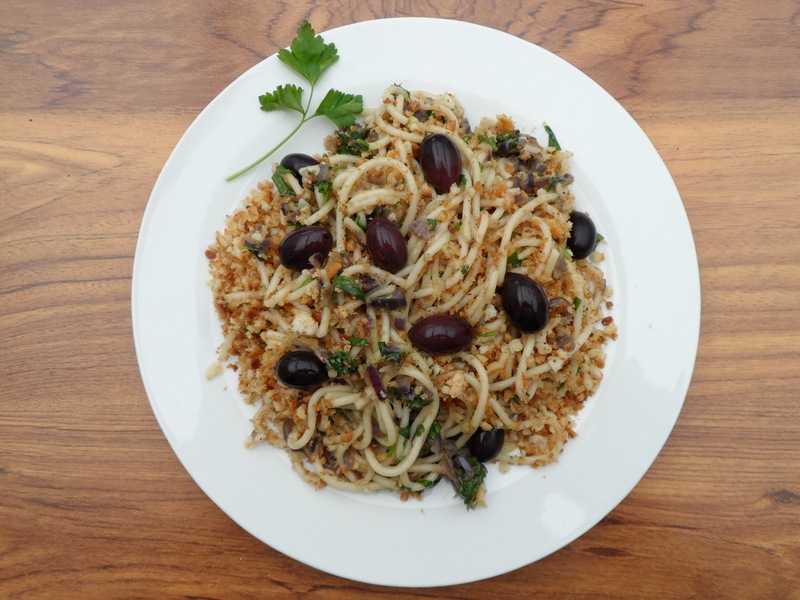 I added whole Kalamata olives at the end, but you could use any olives that you like. My wife suggested adding squid to this dish which is a great idea. Maybe next time I’ll use a variety of seafood and a little squeeze of lemon. A creamy, comforting, cuddle in a bowl. I’ve touched upon this subject before when sharing a recipe for paella. One has to be very careful about recipe titles because when it comes to food with heritage, it is very easy to incur the wrath of proud and passionate people. This is no bad thing. It does mean that food bloggers need to write sensitively about regional food and be clear about what something is, or in many cases, isn’t. Pasta Carbonara. It’s a dish that I actively avoid at restaurants. I’ve eaten gloopy, eggy, garlicky, salty heaps of the stuff and rarely felt like doing anything afterwards except perhaps having my arteries cleaned. In its simplest form, Carbonara should be silky and smooth and made with little more than egg yolks and a few simple ingredients. My own version of this dish includes double cream, which for many, will instantly relegate the recipe to the rubbish restaurant examples mentioned earlier. However, there are no gimmicks in this dish, only good ingredients and simple cooking methods. My version is by no means traditional or definitive, but neither is it an attempt to insult or distort the original. I’m not too worried though, since Pasta Carbonara is a 20th Century recipe and less likely to fire up any genuine anger from would-be pasta experts. In any case, what passes for Carbonara in my house, is a creamy, comforting, cuddle of pasta and dairy decadence. It never fails to satisfy. I boiled up the pasta as per the packet instructions and then heated a large amount of butter in a separate pan to fry the bacon in. When the butter had melted, I added the bacon lardons and the oregano. I fried them until just brown and poured in the cream. I then took the pan off the heat and stirred everything. I then ground quite a lot of pepper into the sauce and tipped all of the cheese in before giving it another good stir. In went the cooked and drained pasta, but I didn’t add any of the pasta water as chefs often make a point of recommending these days. I tossed the pasta in the sauce before adding the eggs and stirring continuously until everything was silky and ready to devour. The real beauty of a good Carbonara is the glossy coat that the eggs give to it. If you make the mistake of adding the eggs while the sauce is cooking, or indeed while the sauce and pasta are still on the heat, you’ll end up scrambling the eggs and getting the same texture as egg fried rice. It’s really important that the pan is off the heat and also that your eggs are pretty fresh. All that’s left is to enjoy it with a grating of some more cheese and a good glass of white wine. Now that’s what I call comfort food! Backpacking brings with it numerous food atrocities and experiences worth sharing if only to warn would-be adventurers. Each trip is filled with moments to savour and moments to forget about, but each is unique and I guess that’s one of the many attractions of independent travel. Last year, me and my intrepid wife returned to Eastern Europe to visit new countries and enjoy the rich culture of towns and cities we’d read about. On the final leg of our journey, we stopped for a couple of days in Bar, Montenegro. This coastal town had some great seafood and wonderful wine. It was on a balmy night, at a rather basic-looking eaterie, that we sampled the best squid we’d ever eaten. Grilled over an open fire and dressed in oil, lemon and garlic. It was served with a potato salad and was one of the food highlights of our entire three-week trip. I stopped buying garlic from supermarkets a long time ago. generally overpriced and anorexic, the specimens available for consumers is pretty embarrassing. One trip to your local green grocer will confirm the disparity between the quality in supermarkets and what local veggie shops stock. In fairness, the food miles clocked up for this quality produce is huge because I buy Chinese garlic. Despite this, the sheer size and wonderful taste mean there’s no contest. It’s the same with lemons, which again, are some of the poorest quality fruit on offer at supermarkets. The insatiable urge to wipe out local independent stores by providing the widest range of produce possible, is not matched by well-sourced, high quality food. This means that at some point in the near future, consumers will be left with no choice, but to buy all their fresh fruit and vegetables from supermarkets because their choices locally have been reduced so much. While some will be happy to part with their cash for bottom of the barrel produce, many will be disappointed unless they demand quality now. I’m voting with my feet and supporting local suppliers. It’s the only way to guarantee decent food! Cook the spaghetti according to the instructions. Meanwhile, prepare the seafood. 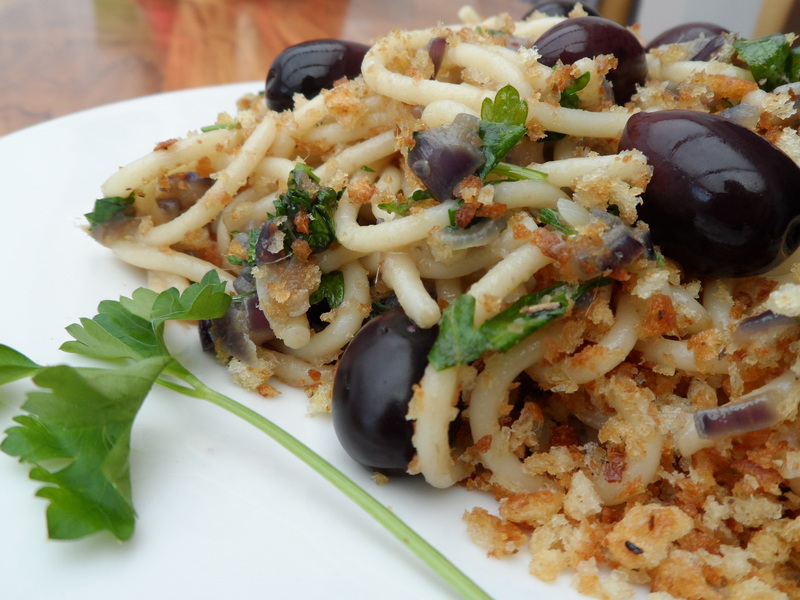 Cut the squid into thin rings and make sure that the beak has been removed by your fish monger. Butterfly the king prawns by carefully running a sharp knife along the back of each one. Grind plenty of pepper over the prawns and squid and set aside. Next, heat some oil in a frying pan and add the chilli and garlic for a minute. Throw in the seafood and toss to coat it all in the garlic. Add the zest of the lemon and the juice of half of it. The seafood needs to be cooked on a high heat for a short time to prevent it from becoming chewy. Once cooked, add the parsley and make sure that everything is coated evenly. You may need to add a little more oil at this point. You don’t want it to be too dry. Add the cooked spaghetti and fresh rocket leaves and season with sea salt and more pepper if you like it. 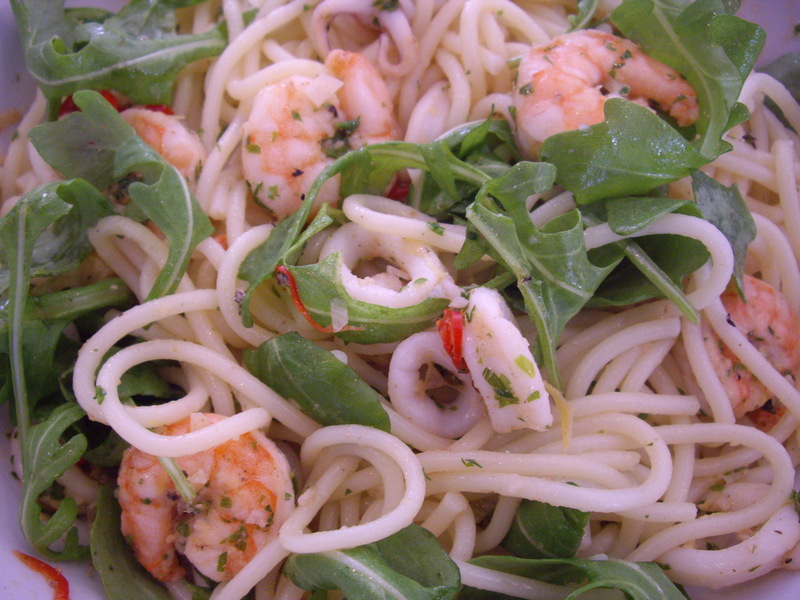 Make sure that the pasta and seafood are mixed well and add more lemon and oil to taste. Serve immediately. White wine’s a winner with this! The simplicity of this dish is obvious. The flavours? Full on.